GUEST ARTICLE: Lenovo Australia loaned me a black IdeaPad S10e netbook to use during my recent trip through Tanzania for ActionAid Australia‘s Project TOTO. While I knew it’d be a step down from working on my usual MacBook Pro, with its 2.5GHz Core Duo and 4GB of RAM, it still seemed just a little too much of a step down for working on the road. 10.2-inch glossy screen – remarkably readable even with the brightness turned way down to save power. Physically it’s a solid, chunky design – unlike some flimsy-feeling netbooks. I threw it in my backpack with confidence. There’s also 2 x USB ports, Cardbus, VGA out, and robust-looking microphone and headphone sockets. Yes, there is a webcam, and it did seem better in low light than my Mac Book Pro’s – though it was no side-by-side test. Energy efficiency seems good. On “Low Power”, the 6-cell battery lasted more than five hours on simple reading, writing and email tasks. Presumably on “Super Energy Saver” it’d last even longer. Lenovo loaned me a second 6-cell battery (AUD 149 rrp), but it was never needed. But the trade-off is sluggishness. Even upgraded to 2GB of PC2-5300 DDR2 SDRAM (1GB is standard) it seems slower than I’d expected. That’d be the 1.GHz Atom N270 single core processor combined with a slow 5400rpm hard drive. Oh, it’s 160GB. You’re welcome. Once the computer was loaded with Nokia PC Suite so I could tether it to my N96, from power-on to the desktop appearing took 55 seconds. It’s another minute or so until everything’s loaded and you’re hourglass-free. It’s a shame Lenovo Australia aren’t selling the Ubuntu Linux version here, because a speed comparison would be worthwhile. Lenovo’s ThinkVantage tools continue to irritate rather than help. In my experience, they simply don’t play well with XP’s own tools for things like wireless and screen settings – something that continually generates confused support calls from my ThinkPad-equipped clients. On every boot, the S10e displayed “Your computer’s screen resolution and colour depth are currently set to a very low level”, despite both Windows XP and ThinkVantage set at the correct 1024 x 576 pixels at 32 bits resolution. If you need to get serious work done, though, bring a full-sized laptop. The S10e’s cramped keypad, trackpad and screen will drive you mad. And if you handle a lot of email in Outlook 2007, be prepared for plenty of scrolling and waiting. EDITOR: PS Lenovo kindly donated 2 Thinkpad notebook computers to ActionAid Australia’s Tanzania office. 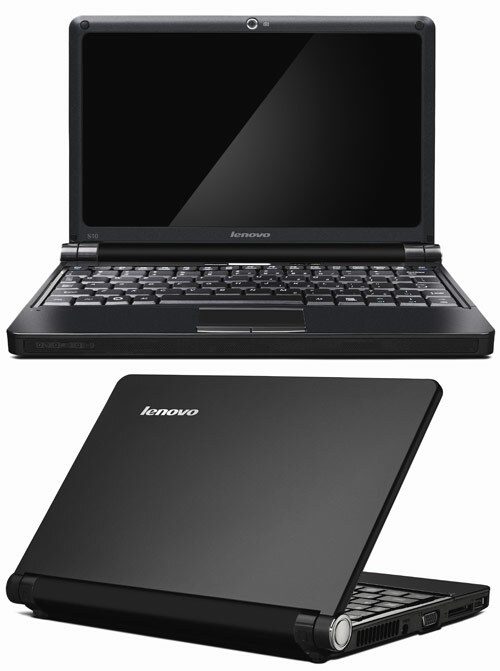 Despite its reduced size and screen resolution, the Lenovo IdeaPad S10e is one of the best netbooks on the market. It’s very well built, it has an ExpressCard/34 slot expansion slot and its battery lasts a long time. Its keyboard is hard to get used to, but some of the people we showed it to loved it. This guest technology review has been written by my friend Stilgherrian. He’s an opinionated and irreverent writer, broadcaster and IT consultant based in Sydney, Australia (warning: he can be entertaining, mercurial, quick-witted, sometimes offensive, often insightful).